Now before we talk about breeding of snails you must first be aware of the different snail species available in Nigeria. This is because a lack of knowing the specie will make it confusing in knowing the right snail breed most desirable for you as a snail Farmer to breed. All snails may look alike but are not the same as it were. If u do not have an eye on snail u may not really know the differences. That is why it is essential you know the different snail species common to us here in Nigeria and most Africa countries. The choice of breed is specifically the snail farmers need of breed he or she decides on. There are three major breed of the GALS i.e Giant African Land snails we can find in Nigeria. 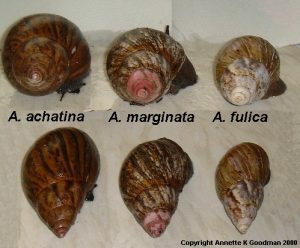 Now less describe each of these three common snail species briefly. This species occurs in Western Africa: Cameroon through Democratic Republic of the Congo, and can be found in the Caribbean, in Martinique. The AM is a major breed is a core breed synonymous with Nigeria. It is the most common breed in Nigeria, is a species of air-breathing tropical land snail, a terrestrial pulmonate gastropod mollusk in the family Achatinidae. The AM specie is also known as the West African Giant Snail or the Giant West African Snail or Banana Rasp Snail; it grows bigger among all the other species in Nigeria. There are certain features predominant with the AM snails. The AM snails has a lower egg production rate unlike the other two species i. e. the AA and AF. The AM lays between 5 to 15 eggs per clutch as the case may be. This happens at least between 3 to 4 times in a year. It takes up to 21 to 32days to hatch as the case may be. There are exceptions though which can take up to 2 months for the eggs to hatch finally. AM snails can start laying from the 9 months old i.e to say at this stage it is sexually matured to lay eggs. In addition AM snails if matured can weigh up to 500 to 600 grams, Moreso it can measure up to 20 to 25cm in length, They can grow up to 20 cm long, and live up to 10 years. The fleshy part is usually dark brown in color, the shell is blunt and less pointed at the tail end but round unlike the other two species. AM is sturdy and fatter, it has white or yellow tapered lids with sturdy end. The snail has a bulbous protoconch that is large and broad, with a white or bluish-white columella, parietal wall and outer lip. The shell of the snail can grow up to 21 centimeters in height, and 13 centimeters in diameter. The shell, when magnified, has the appearance of a woven texture. The only commercial significance of the AM snail specie is the Giant size. AM is only priced for its large size and nothing more. Although most local buyers are interested on the size of snails rather than any other features. So we need to mark the difference between the various specie. Achatinids are nocturnal forest dwellers but can adapt to disturbed habitats. The snails prefer concealed habitats and if overcrowding occurs, they may colonize more open habitats. During periods of high humidity, Achatinids are more active but if the individuals are found during broad daylight it is most likely due to high population density. Eggs of Achatinids are normally laid in the soil, but can be found under leaves or rocks. They produce as many as 40 eggs which are yellow in color with dark blotches and an incubation period of approximately 40 days. 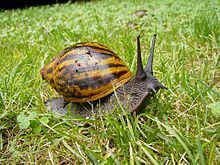 This is a species of very large, air-breathing land snail, a terrestrial pulmonate gastropod mollusk in the family Achatinidae. The name “Achatina” is from “achates”, Greek for agate. The species is believed to be native to West Africa, within 160 to 300 kilometres of the coasts of Sierra Leone, Liberia, Ivory Coast, Togo, Benin, Ghana, and Nigeria. The AA is found in Nigeria but not as common as the AM specie. It is also called the Giant Tiger Land Snail or African giant snail. AA snails though not really a common snail in Nigeria; we do have snail farmers who are breeding them in mass in Nigeria. However note that if you don’t know much about snails as a snail Farmer you may not be able to identify nor differentiate it from is closer counterpart the AF because they have almost similar features. AA has its own uniqueness from AM. One of such is the rate of egg production. AA and AF snails reproduce rapidly unlike the AM. Although AM eggs are usually bigger in size compared to AA and AF snails that are more smaller in size. AA can lay up to 200 to 500 eggs per clutch. It can do so at least 3 to 5 times in a year. It takes btw 21 to 32 days for the eggs layed to hatch. AA snails can get matured and start laying eggs from 6 to 8 months as the case may be. AA has sharp tail ends and 6 to 7 whorls. It takes less time to grow to egg laying age. It also prefer a more humid environment unlike the AM specie. The body of the AA snail is silver brown in color. The shells of these snails often grow to a length of 18 centimetres (7.1 in) with a diameter of 9 centimetres (3.5 in). Certain examples have been surveyed in the wild at 30×15 cm, making them the largest extant land snail species known. Achatina Fulica (AF): The AF snail also known as the Garden Snail, It is also famously known as the giant African snail or giant African land snail. it reaches 20 cm in length or occasionally more, with a shell length up to 20cm and a maximum diameter of 12cm. It is conical, the spiralled shell is pre-dominantly brown with weak, darker banded markings across the spiral. The tail end is unusually sharp just like the AA. The AF can also be found in countries like: Ethiopia, Somalia, Mozambique and the likes, is available in Nigeria. The most common characteristics is the egg production rate just as the AA. It lays up to 200 to 500 eggs in a clutch and can lay that up to 3 to 5 times in a year. This species is a simultaneous hermaphrodite; each individual has both testes and ovaries and is capable of producing both sperm and ova. Instances of self-fertilization are rare, occurring only in small populations. Although both snails in a mating pair can simultaneously transfer gametes to each other (bilateral mating), this is dependent on the size difference between the partners. Snails of similar size will reproduce in this way. Two snails of differing sizes will mate unilaterally (one way), with the larger individual acting as a female. This is due to the comparative resource investment associated with the different genders. Like other land snails, these have intriguing mating behaviour, including petting their heads and front parts against each other. Courtship can last up to half an hour, and the actual transfer of gametes can last for two hours. Transferred sperm can be stored within the body for up to two years. The number of eggs per clutch averages around 200. A snail may lay five to six clutches per year with a hatching viability of about 90%. Adult size is reached in about six months, after which growth slows, but does not cease until death. Life expectancy is commonly five or six years in captivity, but the snails can live for up to ten years. They are active at night and spend the day buried underground. The adult snail is around 7 centimetres (2.8 in) in height and 20 centimetres (7.9 in) or more in length. The shell has a conical shape, being about twice as high as it is broad. Either clockwise (dextral) or counter-clockwise (sinistral) directions can be observed in the coiling of the shell, although the right-handed (dextral) cone is the more common. Shell colouration is highly variable, and dependent on diet. Typically, brown is the predominant colour and the shell is banded. The shell is particularly tough and has the highest heavy metal content of any snail species. The AF has more whorls than the other two specie and have the sharpest end and more conical. It reaches sexual maturity from 6 to 9 months. It lays its eggs and it takes between 21 to 28 days to hatch . The most unique thing about this specie is that it is adaptable to most environment unlike it’s counterpart that needs humid environment. Breeding stock is also known and called Parent Stock, It is the First set of animal or specie that a farmer intends to start is production from. CONDITIONS FOR SELECTING BREEDING STOCK. In the selection of the right breeding stock you need to watch out for some features on the particular snail specie you wish to breed. It is recommended to use sexually mature snails, weighing at least 100-125g, as initial breeding stock. We do recommend the size known as point of lay snails. This is because the growth rate is also high and is close to laying eggs. Snail Farming should preferably start at the onset of the wet season. Snails are active at night and on cloudy or foggy mornings. Any intending snail farmer purchasing breeding stock from snail gatherers or from the market or the forest should expect a fairly high level of mortality as a result of poor handling and the adjustment to different foods. Moreover, the most reliable way of obtaining parental stock is from known breeders or farmers you know. Such parent snails might be more expensive than snails from other sources, but they are better and safer because they have been properly fed and managed from hatching, and have not been damaged during collection and subsequent handling. Once the snail farm is established, you the snail farmer should or can now select breeding stock from your own snails. Breeding stock must be selected in the wet season. Take note of the following terms when considering selecting choice of snail. Establishment rate (percentage of snails likely to survive after hatching) . The growth rate of the Shell strength is a necessary point to note as well. As a general rule, the fastest growers with the strongest shells should be selected as breeding stock. The stronger its shell, the better the snail is protected against predators. Snails are known to escape from enclosures that are not properly protected or covered. It therefore becomes imperative that snail houses should be protected to prevent the snails from escaping and be predator free. The housing for raising snails varies with purpose. However, it could be made of wooden materials, wire mesh or even local materials whether outdoor or indoor. 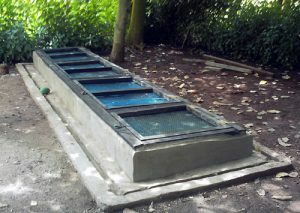 Depending on the size of the farm, cages or hitch boxes, trench pens, used types local baskets, movable pens and mini paddock are used to prevent snails from escaping. The cage should not be exposed to direct sunlight as this can raise the temperature of the enclosed container to injurious levels. However, they should be exposed to normal day/night cycle where cage boxes are used the cover should be meshed to allow spraying of water without having to open the box. No matter the type of housing, the habitat of snails must be taken into shade as snails like hiding places. When snails are raised indoors under controlled environmental factors favouring production must be provided. The housing must be provided with devices for measuring humidity (hygrometer), temperature (thermometer), soil moisture and light (in-foot candles) weighing balance, soil testing kit, magnifying glass and watering cans. For information on how to get the E-book or you need a pratical training enroll for Entrepreneurial Training at our office or call 08034851495, 07086221295, 08093582213 click for more information. We also setup farm and Agribusiness enterprise for our clients.